Israelis and Palestinians are being brought back to the table, but no one really seems to be all that happy about it. Indeed, I can’t remember a time when renewed peace talks were greeted with such widespread cynicism. And that’s when you can even read about it at all – as I scour my usual media outlets for news and commentary on the peace process, I’m getting the distinct impression that this kind of thing is simply not considered to be news any more. I used to believe where there’s talk, there’s hope. (In fact, I think I’ve even written those very words on this blog once or twice before). I don’t think I really believe this any more – not, at least, when it comes to the Israeli-Palestinian peace process. For almost two decades, the US and the international community has been brokering talks between both sides and now this is what it has come to: beyond the pro-forma diplomatic statements, everyone seems to agree that it’s really just a road to nowhere. And a half-hearted attempt to bring the “crippled and the helpless” to the bargaining table simply doesn’t inspire hope. Quite the opposite. I’m not even tempted any more to engage in an analytical discussion of how/why/where talks have failed. There are still more than enough pundits out there ready to parse the political maneuvering. To my mind, it’s all fairly moot at this point. For so many years, so many of us have been working overtime to advocate for the peace process. But while so many of us have held forth the two-state solution as a kind of Holy Grail, the prospect of a viable Palestinian state has grown increasingly remote. Most Palestinians — and many on the Israeli left — argue that there are now too many Israeli settlements in the West Bank for a viable, contiguous Palestinian state to arise there. Settlement growth has continued despite a construction moratorium announced by Mr. Netanyahu. Moreover, support for many of the settlements remains relatively strong in Israel. In other words, if this view holds, the Israelis have closed out any serious option of a two-state solution. So the talks are useless. That’s really the crux of the issue for me: peace without justice is no peace at all. Whether or not there is eventually a one-state, two-state or fifteen-state solution, it will need to be a just solution. And at the moment, justice seems to be precisely what is missing from the peace process. At the end of the day, Israel simply cannot claim to take the concept of Palestinian statehood seriously while it establishes Jewish settlements throughout the Palestinian territories with impunity. Israel cannot say it accepts the concept of a Palestinian capital in Jerusalem yet at the same time evict Palestinians from their homes in East Jerusalem with a clear intention of Judaizing these neighborhoods. And perhaps most critically, Israel cannot claim to meet the Palestinians across the peace table in good faith while it oppresses Palestinians on a daily basis. My friend and colleague Cantor Michael Davis once said to me that the real problem with the peace process is that “we are focusing exclusively on the future at the expense of the present.” I agree. For far too long we have been using the peace process as a shield to keep us from honestly facing the very real and troubling human rights abuse Israel is committing on the ground right now. Yes, there will need to be a political solution to this conflict. But until a present justice is consciously attached to a future peace, I believe in my heart that the peace process will remain as good as dead. This entry was posted in Human Rights, Israel, Palestine, Peace, Politics on August 22, 2010 by Rabbi Brant Rosen. Netanyahu said yesterday that a future Palestinian state would have to be demilitarized and recognize Israel as the homeland of the Jewish people. But of course a demilitarized state is not a state at all–it doesn’t have full sovereignty & cannot defend itself. What he wants is a Palestinian colony or protectorate. And this is what all Israeli governments have wanted. The idea of a Palestinian state, an actual state, has been anathema to Israel since the beginning. The so-called “peace talks” have never been anything more than a charade, a convenient holding action. And it allows the US to make another pious pretense of being a broker for peace and justice. Sobering words, Brant, and thank you for having the courage to speak them. So often, as an American Jew, it has been scary to say words like, “Forget about the ‘peace process,’ we need justice and human rights for all,” for fear of being labeled things like negative, pessimistic, anti-Israel, etc…But it is true. How many times can the leaders come to the table and have an authentic exchange, when the tale told from the ground is so different? So when you said, “For me, the much more critical and pressing question at this point is not “how can we get both parties to the table?” but “how can we find a way to extend civil rights, human rights, equity and equality for all inhabitants of Israel/Palestine?” feels like an authentic, realistic, and sadly true account of what is going on. There is no peace without justice, without complete stories, without authenticity from the leadership, and so thanks again Brant for taking the lead and for saying out loud with courage what needs to be said, and how timely with the holidays coming up, to say them. What a depressing post. And yet I can’t argue with your points or your conclusion. Where do we go from here? We bear witness to what is occurring in Israel/Palestine. We speak out publicly – as Jews who are passionately concerned about the futures of all inhabitants of I/P. We demand that Israel be held accountable for its oppressive actions against Palestinians. We call upon our government to attach all future aid to Israel to compliance with American policy on Israeli settlement activity. We refuse to patronize companies or invest in funds that directly profit from the Occupation. …and perhaps most important: we ignore the accusations of self-hatred and Israel-bashing and encourage other liked-minded American Jews to join our call. Thanks Brant–I just returned from a month in Yaffo, studying at Bina and meeting with a variety of Israelis, Arab Israelis, Palestinians residing in Israel, and everyone in between. I think you’re right on target–peace without justice is impossible and it’s time to focus on justice. across as anti-Israel (an old problem, by now)? which we are now calling Canadian Friends of RHR. Montreal where a rabbi has offered us something of a home. I am only saying all this by way of introduction. the living world as a whole. I’m very moved by this, not least because that verse has been playing in my mind for the past few weeks as well. It’s not just that we’re given the choice between life and death. Both are set before us in the Torah, BY the Torah–which is to say, we can draw on material from our deepest traditions to support either choice, either impulse, the best and the worst of us. “Everything is in it,” as the Talmud says; we can’t just follow, but have to choose, ourselves, day after day after day. I don’t actually know why I am bothering to ask but, can you tell me exactly what the Palestinian “leadership” would have to do before you would write that they have some responsibility in the failure of the peace process?? Apparently, denying Israel’s right to exist, misappropriating humanitarian aide, hiding behind women and children and murdering innocent people is not enough for you. The Palestinian leadership participating in the peace process is the PA – not Hamas (as you seem to be insinuating.) If one was to ask whether or not the PA was holding up its own responsibilities in the peace process – which means largely guaranteeing and maintaining security in the West Bank – I’d say the answer is absolutely yes. In my opinion, the US and Israel have utterly hung out the PA and the moderate Palestinian factions to dry over the course of the peace process. If, following Oslo, Israel had shown good faith by not radically increasing its settlement of the territories, then the PA would have rightly been able to claim that their willingness to participate in the peace process was making a real difference on the ground and in the lives of Palestinians. Instead what has happened is that Israel’s behavior during this period has only neutered the PA in the eyes of their constituents – while strengthening the hand of groups such as Hamas. I didn’t know that the PA recognized Israel’s right to exist as a Jewish state. PA sponsored materials consistently deny not only Israel’s right to exist, but also the Holocaust! I think it would be a step in the right direction for PA to stop disseminating materials that advocate the evacuation of the Jews from Palestine, and I’m not talking about the West Bank. The PA has recognized Israel’s right to exist since 1993. The addition of recognizing Israel as a “Jewish” state is another hoop that Israeli administrations have more recently entered into the negotiating mix. (The) idea of Palestine recognizing not only Israeli sovereignty and its right to exist, but recognizing it as a Jewish state is a deal-breaker. It is a willful wrench that has been thrown into negotiations, actually by Ehud Olmert, who first brought the idea to the fore. It’s also unthinkable. (Israeli PM spokesman Mark) Regev, like many other advocates for the official Israeli position, puts this out there as if it is a normal demand. Far from it—no country recognizes another “as” anything. It simply recognizes another country’s sovereignty, with the rights and responsibilities that implies. One of those rights is for any country to define itself, through its own political and social processes. Re “PA sponsored materials:” you didn’t provide any sources for this claim. If it is true, I would only say that every regime has its odious elements. For its part, the current Israeli administration includes a Foreign Minister who supports ethnic cleansing, advocating the transfer of Israeli Arab citizens out of Israel. What are you trying to say about the PA? That it is too odious a partner for peace talks? If so, maybe you should get on the phone to Obama, Bibi (as well as the Shin Bet and the IDF) and explain to them that they are all engaging with a rejectionist, Holocaust-denying, genocidal regime. I don’t know if this responds to Lisa’s point or not, but it does strike me that there are really four sides to this conflict, and have been since Oslo, at least. Among Israelis and among Palestinians, there’s a side that wants peace (IP / PP), and a side that wants victory (IV / PV). I have no doubt that a group of IP and PP negotiators could come up with an agreement that the IP and PP constituencies could live with. They’ve probably done so several times already. The trouble is, neither the IV nor the PV sides will settle for what that agreement gives them, and each is perfectly willing to use violence in pursuit of eventual victory. And each time the IV or PV sides use violence, those on the IP and PP sides look more foolish for ever trusting their counterpart. In short, yes, there’s plenty of blame to go around. Eric, with due respect for your thoughtfulness on this question, I would put it quite differently. I would say first that there are far more than two points of view on the Palestinian side, and most are a good deal more nuanced than most people care to believe. I would say the points of view range from that of the small handful of Palestinians who, at least in theory, would only accept the return of every inch of their homeland, sans Jews, to the great majority of Palestinians who have been willing for many years to compromise by relinquishing their right to the part of their homeland that lies inside the green line in exchange for self-determination in a very small portion of it – i.e. a fully sovereign independent state in the pre-June, 1967 territories with minor adjustments as allowed for in UNSC 242. That involves a set of genuinely painful concessions on their part that virtually no one recognizes or acknowledges. No set of negotiators has ever come up with anything they could live with mainly because there has never been a real “partner” on the Israeli side. Even Palestinians who most fervently wish for peace have limits to what they can conceded, and those limits include giving up the very things that constitute sovereignty and independence, such as reasonably contiguous territory (allowing for the disconnection between Gaza and the West Bank), freedom of movement, control over one’s own borders, sea coast, air space, and natural resources, not to mention the right to protect the security of the State and its citizens. Therefore, I guess even these most peace-seeking Palestinians could be labeled as part of your PV category because they are not willing to accept peace at the price of self determination in their own fully sovereign and independent state. And then there is the only truly just solution, which is one unitary, secular, multi-national truly democratic state in all of Palestine in which everyone is an equal citizen with equal rights, equal responsibility, equal representation, and equal access to state resources. But of course by definition that cannot be a Jewish, or a Muslim, or a Christian, or a Druze, or an Arab state, and therein lies the rub since it would mean the end of the Zionist dream of a Jewish state, which is by definition discriminatory. As for Israeli Jews, I know that there are some, though their numbers seem to be dwindling, who are committed to peace, and who recognize that peace demands at least some degree of justice for the Palestinians. There are even some Israeli Jews who embrace, or least are prepared to accept, a one-state solution even knowing it means the end of the Zionist dream of a Jewish state. Unfortunately, there appear to be far more Israeli Jews whose sense of entitlement, and desire to acquire, however illegitimately, more and more territory outside the Green Line override their desire for peace, and unfortunately these are the Israeli Jews who, along with their complicit partners from the “honest broker” United States have controlled the “negotiations” all along. Thanks for your long and thoughtful response. From a continent away, it’s hard for me to know the actual range of opinions on the ground, on either side. I’m not surprised to hear that my clean-cut binary (victory vs. peace) oversimplifies things–on reflection, I’m sure it responds as much to things I’ve heard here in the States as anything else. Eric, thanks for listening and being open . Someone, I don’t recall who, likened the “peace process” to negotiating over dividing a pizza while one side gobbles it up as quickly as possible. I would take that a step farther, and say it is like negotiating over the division of a pizza party B stole from party A while party B continues to gobbles it up in a very “in your face” manner as fast as he can. It should be quite obvious that this is what is going on now, but in reality it is nothing new and goes back to Oslo and even before. Frankly, it is not a bad thing at all if the “peace process” is dead. It was born malformed, and has never been what it was purported to be. You might be right about the attitudes of most Palestinians, but my experiences have not been encouraging in that respect. I have done dialogue with Palestinians under various auspices, and was always disheartened by the fact that there were very few who were willing to let there by a Jewish state. There were very few who were in favor of a two state solution. There may be Palestinians who are actually for a peaceful two state solution, but I have yet to find many (and I would think that Encounter or the like would be able to find them). My friend who has participated in much more dialogue than I have, doing various summer programs with Palestinians, told me that those who want to go back to ’67 borders are considered radicals by their community. Which brings me to the absurdness of a one-state solution. You actually think that the Palestinians and the Jews can live under one government peacefully? Really? Have one state solutions been successful in other regions of the world? Peace and justice are in tension here. Any peaceful solution will not be just. That’s why we call it concessions. Also, you are arguing for Eric to find nuance in Palestinian positions on the conflicting you don’t do that with Israeli positions on the subject. Even among pro-settlement Israelis (whose numbers are dwindling), there is more nuance than you would have us believe. I’m not trying to say that the PA is too odious a partner to engage in talks. I’m trying to say that your demonizing Bibi while portraying the PA as the perfect partner for peace is silly and deceptive. Each side has made mistakes, and they are actually sort of similar in that both Bibi and Abbas are moderate politicians working with people who are a lot more extreme. You seem to think that Bibi is too evil a person to engage in serious dialogue and seem to be against peace talks. I’m not. I’m pro-Israel and pro-peace. Peace and justice are mutually exclusive here, and I choose peace. I find it interesting that you blame Israel for preventing a two-state solution from happening but yet you, yourself, are against such a two-state solution. If you’re angry about Bibi’s provocations in East Jerusalem (by which I hope you mean Sheikh Jarrah as opposed to Ramat Shlomo), you should be equally angry about PM Abbas honoring a terrorist (http://edition.cnn.com/2010/WORLD/meast/07/03/munich.mastermind.dead/index.html?fbid=UmPw3wDi82F#fbid=SqAgdvj-f7g&wom=false) or that the PA had a link to the Protocols of the Elders of Zion on its website under “History of Zionism” (http://www.ynetnews.com/articles/0,7340,L-3087167,00.html), or that the Holocaust is not taught in UNRWA-run schools in the West Bank or Gaza (http://en.wikipedia.org/wiki/Hamas%E2%80%93UNRWA_Holocaust_dispute). I could go on. You’re right. I am asking for Abbas to give up his the Palestinian refugees’ rights of return. One of my teachers, a prominent Israeli left wing politician, referred to the Palestinian right of return as “crazy.” That is the single biggest obstacle to a two-state solution. In an ideal world, the settlements could remain in a Palestinian state as a Jewish minority, just like Palestinians currently residing in pre-1967 Israel would (and do) constitute an Arab minority. Hopefully both sides would treat their minorities with fairness. But the influx of the hundreds of thousands of people who were either expelled or left in 1948, along with all of their descendants, would mean the end of Israel. You are wholly delusional if you believe that a Palestinian majority in Israel proper would treat the Jews even as nice as Israel has treated its Arab contingent. Regarding Lieberman, I followed the link, and the J Street claim that Lieberman supports ethnic cleansing I find to be inaccurate. The only source I can find for his quote “We will never agree to a definition of ‘two states for two peoples'” is J Street (http://www.google.com/search?sourceid=chrome&ie=UTF-8&q=%22We+will+never+agree+to+a+definition+of+two+states+for+two+peoples%22). Also, just for the record, I’m also for ethnic cleansing. Namely, I think that many of the settlements will probably have to be disbanded in a peace deal. Most people in favor of a two-state solution are for ethnic cleansing. Lieberman has said that he would be OK with evacuating his own home in order to achieve a two-state solution (http://en.wikipedia.org/wiki/Avigdor_Lieberman#Lieberman_Plan). Lieberman is actually not for population transfer. Redrawing borders can hardly be deemed ethnic cleansing. I wish people would actually look at his policies rather than getting caught in his rhetoric. As a sidenote, I enjoy that you describe Mitchell Plitnick as “astute Mideast analyst” and refrain from identifying his affiliations. Note that I have been careful in this post not to use partisan organizations as sources. Richard, you’ve given me a lot to think about this morning! Thanks for that. A two-state solution back in ’48 might have settled down into an unjust but peaceful status quo by now, and it may well be that a two-state solution now, just or unjust, will settle down to a manageable level of conflict in another 60 years. But unless the Israeli / American offer is a whole lot sweeter than the one that’s been leaked by the Israeli press, I don’t see why anyone would accept it. First, when I said that I was in favor of ethnic cleansing, I was referring to ethnically cleansing parts of the West Bank of Jews. It’s fundamentally unjust to insist that a race of people doesn’t have property rights in a certain area, but I think that it’s practical in the name of peace. I am not in favor of transferring Palestinians from pre-67 Israel. Any peaceful solution will not be just, but all of the injustice will not be upon the Palestinians. Namely, those settlers who are told that they can’t stay in their homes are not being dealt with justly, assuming they purchased the land, which the vast majority did. Jews will have to make concessions, too. Some of our holiest sites will be in areas wholly unaccessible to Jews, and if Joseph’s grave is any indication of how they will be treated (http://en.wikipedia.org/wiki/Joseph's_Tomb#Since_2000), this is simply devastating. Asking Jew’s to leave their second holiest site (Hevron) is not an easy concession. But peace demands unjust concessions. Just like in a two-state solutions, Palestinian refugees won’t be able to return to their houses in Katamon, for instance, Jewish refugees from various areas of the West Bank won’t be able to return there. It’s not just. But it’s necessary. I see asymmetry with R. Rosen demanding that people recognize the concessions that Palestinians must make, but he doesn’t recognize the concessions that Israelis will have to make. Also note that a one-state solution doesn’t recognize the Jew’s right to self-determination, which most would regard as unjust. I must admit, I don’t find the concessions that you list to be equivalent in pathos or severity, but I appreciate your spelling them out this way. You can object that this isn’t a fair paradigm as Israel is changing the facts on the ground, which is probably true, but I think that if we are serious about peace, we need to focus on the facts as they are now. It’s not fair, but I truly believe that it is right. This is an interesting angle, and I’ll think about it. I would have thought that not talking about history would simply cement each side into its own narrative–certainly my own experience has been that learning more history has taken me away from my previous views. But then, that was learning I went and did on my own, rather than something someone else brought to me or argued with me about: an internal process, rather than a dialogue. And I was tempted into learning that history by something else: beauty, specifically the beauty of a number of poems, whose background I wanted to learn. Had that learning happened some other way, in a more confrontational context, perhaps it would simply have raised my hackles and defenses. Not sure if there’s a lesson to be derived from that, but I appreciate the insight. I think you’ll find that the party which won a majority in the last elections held in the West Bank and Gaza in 2006 is Hamas. The elected Prime Minister of the PA was dismissed by the then- PA President Abbas in 2007. I’m not an expert, but there’s disagreement over whether he had the authority to do that and replace the Hamas PM with a Fatah PM. And Abbas is no longer the President of the Palestinian Authority because his term of office expired in January 2009. So perhaps rather than talking about “the Palestinian leadership” when you talk about who is taking part in the long-dead “peace process”, you would say “the Palestinians the governments of the US and Israel will talk to…”, or something like that. Otherwise you’re just doing reinforcing the position of those who are not interested in peace. Today’s LA TIMES 8/25 has an article by Rabbi Kenneth Chasen of Leo Baeck Temple. It is an optimistic account of PA Prime Minister Salam Fayyad’s hope for the future. I think if more people felt these talks would go somewhere we’d be hearing a lot more about them. 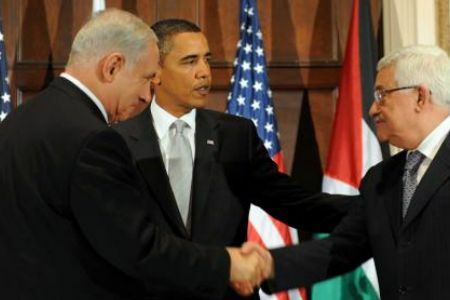 President Obama is trying to reach out to the pro-Israel community with these talks but he may only succeed in further disillusioning them when/if these talks fail. I too share your sadness and it is quite true that there will be no peace without justice, particularly from Israel’s side. I can only hope that somehow President Obama can show himself to be an agile mediator and gently but firmly push Netanyahu towards something closer to a two-state option and perhaps put an end to a long tragic chapter in Middle Eastern history. Otherwise I see only more bitter but justifiable cynicism in the future.